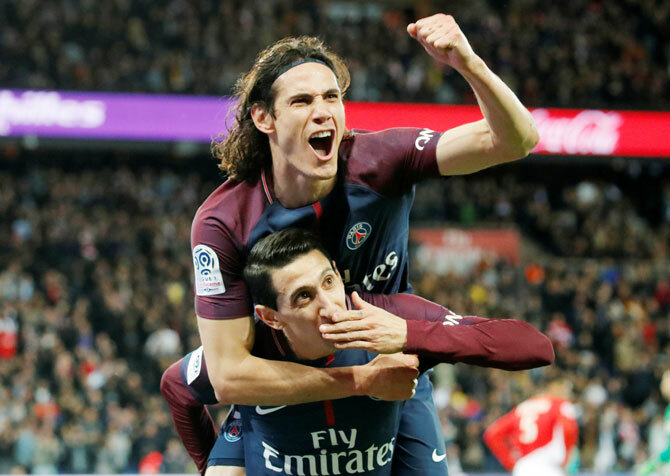 Paris St Germain claimed their seventh Ligue 1 title in emphatic style with a 7-1 home win against defending champion AS Monaco on Sunday. They joined Lyon in fifth place in the rankings of the clubs with the most French titles -- three behind record holders St Etienne. "The team maintained the pressure throughout the game," said coach Unai Emery, who failed to take PSG past the last 16 in the Champions League this season. "Our great goal is the Champions League; it's not easy but we're going to work hard for it." "It is possibly my worst defeat as a coach," said Monaco coach Leonardo Jardim. Monaco, who were humbled 3-0 by PSG in the League Cup final, got off to a good start but the home side had the first clear chance in the 10th minute when Cavani volleyed just wide from Dani Alves's cross. Lo Celso tapped in from Alves's cross from close range in the 14th before Cavani beat Danijel Subasic with a powerful downward header, sending the home crowd into raptures three minutes later. In the 20th, Di Maria beat the offside trap to collect Cavani's through ball and lob over Subasic. Monaco pulled one back, Lopes latching on to Almamy Toure's cross from the right to score for the eighth consecutive time in Ligue 1 -- a first in the French top flight since Shabani Nonda in 2003. "I think it is a serious injury," said Jardim. PSG started the second half cautiously and Monaco seemed to be pushing for a comeback but Di Maria fired home from Pastore's cross to kill all hope for Monaco. AS Monaco fans who made the trip to the Parc des Princes to watch their side thrashed 7-1 by Paris St Germain on Sunday will get their money back, the club said. "AS Monaco has decided to refund the Red and White supporters in the visitors' tribune tonight," the club said in a statement. The visiting side conceded four goals in the opening 27 minutes of a defeat which wrapped up the Ligue 1 title for PSG. Monaco stayed second in the standings, four points ahead of Olympique Lyonnais and Olympique de Marseille.